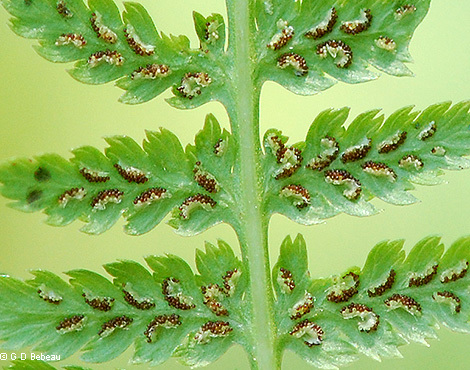 Athyrium filix-femina subsp. angustum (Athyrium filix-femina var. angustum; Athyrium filix-femina var. michauxii) subarctic ladyfern Aspleniaceae ATFIA; Bx, br, pb, rd, vc, wv; NY iw, tr; Q, a, cu; K fs; R, bd, ca, ev, gb, h, lp, lt, pr (Wenskus 2004), sv, w; Often planted in restorations. Athyrium filix-femina subsp. 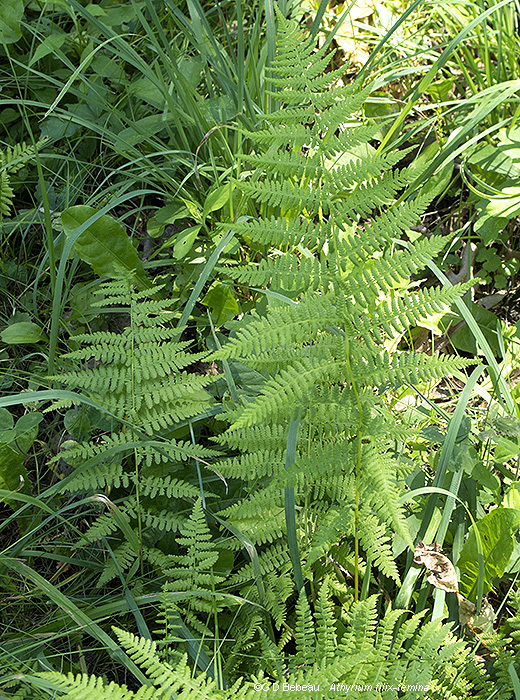 angustum is a fern from a short, creeping rhizome. This subspecies is found from Greenland south to N. Carolina (Flora of North America efloras.org 10/2017). Leaves in tufts, 0.4-1 m long; stalk 15-55 cm long, shorter than blade, the top part smooth, straw-colored, occasionally red (forma rubellum), base dark, red-brown to black, with brown scales 0.7-2 cm long, 0.1-0.5 cm wide; blade twice pinnate to three times pinnate and pinnate-lobed (pinnatifid), 30-75 cm long, 10-35 cm wide, elliptic, widest near middle, tip long-pointed, apex pinnately divided, base narrowed, leaflets (pinnae) 20-30 per side, lance-shaped to oblong, bases almost stalkless, tips pointed, secondary leaflets (pinnules) deeply toothed to divided, lobes irregularly toothed (Montgomery and Fairbrothers 1992; Flora of North America 1993+). Spore cases along veins of ultimate leaflets, curved or hooked at end, becoming brown, spores yellow to light brown; spores produced during summer. Habitat: Herb layer of undisturbed, moist to wet woods, soil pH 4.5-7, tolerates acid soil to pH 3.9 (Greller et al. 1990); tolerant of shade, intolerant of anaerobic soil, fire, and salt (USDA, NRCS 2006). Notes: Leaves eaten by rabbits and deer (Martin et al. 1951). A host of the white-spored fir rust Uredinopsis longimucronata, Basidiomycotina, a fir-fern rust, (Sinclair et al. 1987). The genus Athyrium is sometimes put into the family Dryopteridaceae (Flora of North America 1993+; USDA, NRCS 2006). Athyrium filix-femina var. aspleniodes has been found in Queens, but is mostly a southern variety. It has a leaf stalk about as long as the blade with pale scales at the base, the blade is widest at the base and the spores are dark brown or black (Montgomery and Fairbrothers 1992; DeCandido 2001). Listed as “Exploitably Vulnerable” in New York State (USDA, NRCS 2007). Apparently much used by native Americans for culinary and medicinal purposes. Strong teas and ingestion of large amounts can be toxic (Runesson 2007).